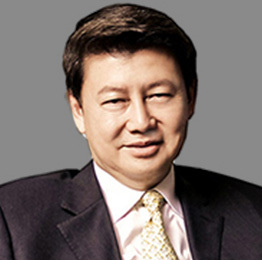 Dr. Henry Lim is currently the Chairman & Chief Executive Officer of the Sterling Paper Group of Companies, a diversified business engaged in manufacturing of paper products, importation and distribution of school and office supplies, furniture, retailing, call center, real estate development and agriculture. The Group is comprised of Sterling Paper Products Enterprises, Inc., Central Book Store, Inc., Expressions Stationery Shop Inc., S.P. Properties, Inc., SL Agritech Corporation, Sterling Global Call Center, Inc., LSL Corporation and SL Hybrid Rice Research Center Inc.He is also the Executive Vice President of Federation of Filipino-Chinese Chamber of Commerce & Industry, Inc., Chairman of the Food Security Committee of Philippine Chamber of Commerce and Industry, Inc., Director of Philippine Stationers Association, Inc., Philippine School Pad and Notebook Manufacturers Association, and Association of Paper Traders of the Philippines.Among his recent awards are ASEAN Business Awards 2015 under the category of Priority Integration Sector (PIS) – Agro-based (Kuala Lumpur), Most Promising Entrepreneur Award 2014 by Enterprise Asia, Finalist for Asia CEO Awards 2013, The BOSSING of 2011: Heroes of Business & Filipino Pride by PLDT SME Nation, Finalist for “Entrepreneur of the Year 2005” by Ernst & Young, Agora Awardee Year 2004 for Entrepreneurship Category by PMA, Received Plaque of Commendation by the China National Hybrid Rice Research and Development Center, Hunan, China for the successful development of SL series hybrid rice in the Philippines in September 2004, and received Plaque of Commendation by the Department of Agriculture for the significant contribution in the research and development of hybrid rice in the Philippines in May 2004.He graduated from the University of the Philippines with a degree in B.S. Mechanical Engineering and took his Executive Education Program in Harvard Business School. He was awarded a Doctor of Humanities in Foundation University, Dumaguete City and a Doctor of Science in Polytechnic University of the Philippines. 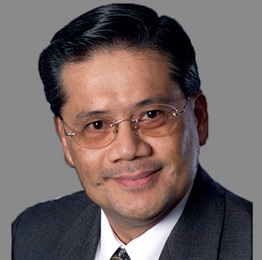 Bienvenido (Nonoy) Niles is currently Chairman and Lead Consultant at Boomerang Research Advisory. He also serves as a Commissioner in the Philippine Racing Commission, Director of Barangay San Lorenzo Business Association and IBIZ Technologies. He is the immediate past Chairman of the Advertising Board of the Philippines (AdBoard), was a part-time faculty member in the Ateneo De Manila JG School of Management, past President of the Foundation of Ateneo Management Engineers (FAME) and a four-time President of the Marketing and Opinion Research Society of the Philippines (MORES).Nonoy assumed the position of President of The Nielsen Company – Asia Pacific Region from 2003 to 2009. In this role, he was the leader of the Executive Committee based in Hong Kong and was responsible for the overall management, business performance and strategic direction of The Nielsen Company in the region that includes North, Southeast, South Asia and the Pacific.Over a 40-year career, Niles has become one of the most respected market research practitioners and leading management professionals in Asia. He is also the recipient of the Philippine Marketing Association’s Agora Award for Regional Marketing Excellence, the Nielsen Asia-Pacific Award for Exemplary Leadership and the Award for Exceptional Leadership in Driving World Class Employee Satisfaction. He has been invited to speak in numerous conferences and seminars locally and regionally on marketing and marketing research topics. Niles earned a degree in Management Engineering from Ateneo de Manila University and completed various leadership and business courses conducted by Macquarie University, Miami University and Duke University. 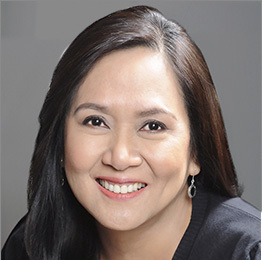 Yoly Villanueva-Ong is the founder of Campaigns Group of Companies (Campaigns & Grey, CAPRI, Camp Cebu, Camp Apple, Neuron, CSR & Bacon Brand Activation).Her numerous achievements in the advertising industry include serving as Chairman of the Association of Accredited Advertising Agencies-Philippines (4As-P) in 1989 to 1990 and in 2006 to 2007. She also chaired the extremely successful 20th Advertising Congress in Subic. She is the Founding President of the Creative Guild of the Philippines, which conferred on her the Lifetime Achievement Award in 2002. That same year, she received the Industry Maverick Award at the 4As-P Advertising Summit. She was also the first Filipino to judge in the prestigious CLIO Awards in New York, in 1994.In 2006, the International Association of Business Communicators (IABC) recognized her as CEO Excel Awardee. She was a finalist for Socially Responsible Entrepreneur in the First Entrepreneur of the Year Awards in 2004, an AGORA Awardee for Outstanding Achievement in Marketing Management in 1999 and a TOWNS Awardee for Communications: Social Marketing in 1995.In 2002, Yoly Ong earned her Master of Public Administration degree at the Harvard Kennedy School of Government in Cambridge, Massachusetts where she garnered two prestigious awards – the Lucius Littauer Award and the Mason Fellows Award.She graduated with a Bachelor of Arts, Major in Journalism, from the University of the Philippines. The UP MassCom Alumni Association, of which she was President from 1995 to 1997, honored her with the Professional Achievement Award in 1990, and the UP Alumni Association in turn gave her the Outstanding Professional Award in Mass Communications in 2002.